Sometimes we forget that just as vegetables and fruit have a season, so too do fish. Sure there are farm raised fish available throughout the year, but sustainable, wild caught seafood is definitely the better way to go. Late spring ushers in wild caught salmon season, which is the perfect time to make gravlax. The classic Scandinavian curing method is the technique I prefer. I figure they’ve been doing this the longest, they’ve probably got it perfected by now. The core ingredients are salt, sugar, dill, and white pepper. Just for good measure, I throw in a couple shots of vodka to aid in the curing process and grated lemon rind for a citrus kicker. (I can’t help messing with success.) And that’s it. It’s ridiculously easy. Seriously, nothing this gorgeous looking and tasting should be that simple. Gravlax can be served at any time throughout the day. 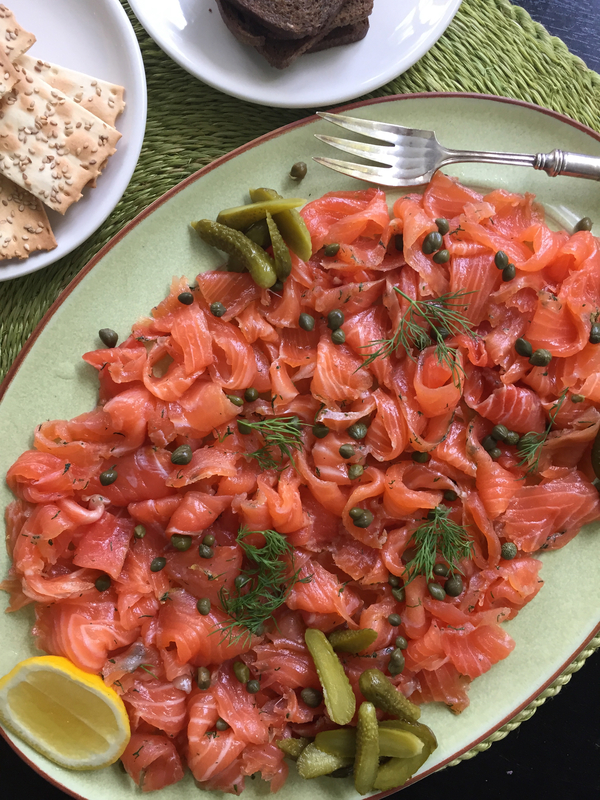 Whether it’s a brunch party or an evening cocktail party, gravlax fits in quite nicely. And if there are leftovers (big if), it’s delicious the next morning on a bagel. First, halve the salmon fillet. If you have a center cut of salmon, slice the fillet in half crosswise. If you have a tail end, slice it in half lengthwise. Be sure all pin bones have been removed. You can do this with fish tweezers or just have it done at the market when you buy the fish. In a small bowl, combine the sugar, salt, dill, pepper, and lemon rind. In a deep dish, place the salmon halves skin side down. Pour over the vodka. Coat both halves with the sugar mixture, pressing it gently into the flesh. Then place one of the halves over the other so that the flesh sides are touching, like a salmon sandwich. Cover tightly with cling wrap. Place a second smaller dish over the cling wrap and top that with some heavy cans so that you weigh the fish down. Let sit in the fridge for 48 hours, basting once with the liquid in the bottom of the dish and then flipping the salmon sandwich. When you are ready to serve the gravlax, rinse off the curing mixture and pat dry (or gently wipe off with a paper towel). Using a very sharp knife, thinly slice the meat off the skin and serve sprinkled with capers and cornichons on rye toasts. Top with dollops of lemony sour cream or sweet mustard. This entry was posted in appetizer, brunch, lunch, main and tagged appetizer, curing, dill, finger food, gravlax, salmon. Bookmark the permalink.